Many towns near Cincinnati began as autonomous villages and became suburbs only as Cincinnati expanded. Glendale, however, was planned as a community in a rural setting. 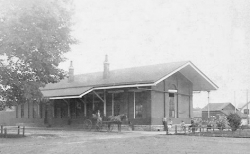 The founders chose this location in the Mill Creek Valley because of its proximity to Cincinnati and its location on the Cincinnati, Hamilton, and Dayton Railroad (CH&D), which was just being built. In 1851 the Glendale Association was formed and 600 acres were purchased. The village was designed around the existing topography of the land, with park-like meandering of gentle curves, and is one of the earliest American communities to do this. E.R. Glenn was among the original landowners and is from whom the village derived its name. 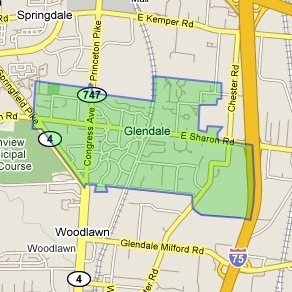 Glendale was incorporated as a village in 1855. Glendale Female College was established in 1854 and closed in 1929. According to legend, Glendale was known for its strong abolitionist sentiments and many homes were used to harbor escaping slaves. Morgan's Raiders broke into the railroad depot and telegraphed false information to Union troops in 1863. The Glendale Heritage Preservation's headquarters are at the old CH&D railroad depot built in 1880, which is now a museum, gift shop, and archive storage facility. Through the group's efforts, the 392-acre Glendale Historic District was named a National Historic Landmark by the U.S. Department of the Interior in 1976. It is the only village in Ohio with this distinction. The Village Office Building, built in the 1870s, was originally a stable, and later was used as the fire and service departments. It now houses municipal offices, a post office and the chamber of commerce.